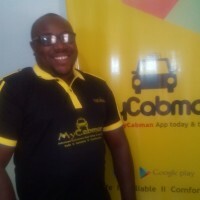 "My Cab Man" and since meeting their CEO, Victor Odimegwu and experiencing their price offering which is mostly fixed, I fell in love completely. Also all I have to do is punch "MyCabMan" app on my andriod phone (and you can, on any smart phone) and hail a cab and they are at my doorsetp to drive me to my destination (s). Have your used My Cab Man before? If No, what are you waiting for, my Abuja people.